WALTHAM - The routine is paramount. People don't understand that. They see Ray Allen, his head meticulously shaved, his jersey tucked carefully into his shorts, his socks pulled up to precisely the same length, and they are drawn to his silky jumper. Can you blame them? It is so smooth, so fluid, so seemingly effortless. Everyone wishes they could shoot like Ray. They tell him that all the time. They are envious, they say, of his God-given talent. "An insult," says Allen. "God could care less whether I can shoot a jump shot." As the Celtics kick off their campaign for an NBA championship tonight in the opening round of the playoffs against the Atlanta Hawks, Allen will leave nothing to chance. He will line up for the tip exactly as he has for his other 73 games. His pregame ritual does not waver: a nap from 11:30 a.m. until 1 p.m., a meal of chicken and white rice at 2:30, an arrival time at the gym at precisely 3:45 to stretch. Allen will shave his head, then walk out to the court at exactly 4:30. He will methodically take shots from both baselines, both elbows, and the top of the key. Allen is second all-time in 3-pointers, 460 shy of Reggie Miller. He has a chance of surpassing Miller, provided he stays healthy, but if he does, it will not be by divine intervention. It will be the result of years of painstaking preparation. It will also be the byproduct of learning to strike a delicate balance between routine and superstition. When Allen was small, he recited a familiar rhyme: Step on a crack, break your mother's back. So what happened if you stumbled onto the line? You'd groan, lament your misfortune, then go home for supper. Not Ray. He would retreat to his room and wait for the sky to fall. "I had a borderline case of OCD [obsessive compulsive disorder]," Allen explains. "I was never diagnosed, but it was something I was aware of." This is how Ray Allen's mind works. If there is a speck of paper on the floor in his house, he cannot walk by without picking it up. He has tried. He has purposely marched up the stairs without correcting the glaring imperfection, but he's unable to eliminate the image from his mind until he goes back down, throws the scrap in the wastebasket, and restores order in his home. He requires the same symmetry in his basketball universe. That's why, when Paul Pierce suddenly began doing 360 dunks in warm-ups earlier this season, Allen demanded an explanation. "We were winning," Allen says. "Why would he change it up when we were winning?" "I was just trying something new," Pierce says. "I missed the shot. So Ray tells me I have to miss it the rest of the year?" 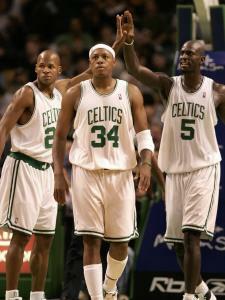 There was considerable discussion before the season on how Pierce, Allen, and Kevin Garnett would share shots. It didn't occur to anyone, except their coach, to consider how they would share their personal space. The wildly divergent rituals of the three superstars was a surprise - and, initially, a problem. "As a team," Allen concedes, "we're all inside a bubble. Each of us only has so much room to operate. You have to carve out your space and recognize that because of someone else's needs, you might have to compromise a bit." There's the free-wheeling Pierce, who never does anything quite the same from game to game. There is Allen, who needs to complete a specific checklist of chores before tipoff. And then there is Garnett, a brooding pregame figure who requires an intense period of introspection to prepare himself. It was inevitable that their approaches would collide. In early December, Garnett was at his locker, alone, silently visualizing his responsibilities for the game. Allen, who had long ago completed his pregame tasks, was joking with Kendrick Perkins and Rajon Rondo. The noise interrupted Garnett's concentration. He barked his objections; his veteran teammate barked back. "They got into it with each other," reports Rondo. "Me and Perk were sitting there going, 'Whoa, what's this about?' "
Pierce observed the verbal skirmish with amusement. "Stuff like that happens on teams all the time," Pierce insists. "Different personalities. But Ray's to blame. He's crazy. One night he gets on the plane and says, 'Paul, you're in the wrong seat.' I told him, 'Man, there's a hundred seats open. Leave me alone.' "
Ray's obsession with routine has struck a chord with Rondo, who confesses, "I probably have OCD myself." The point guard must wash his hands twice at the nine-minute mark of every game. When teammates and fans high-five him, he offers a closed fist to ward off germs. Allen has become his role model, and Rondo has started showing up at the arena three hours before the game to mimic Ray's routine. "I want to be consistent," explains Rondo, "and Ray is all about that." Allen's mantra is that you must walk, talk, eat, and dress as though you are the best. Garnett concurs - to a point. KG does not feel obligated to wear tailored suits to prove his commitment, as Allen does. "Ray is very strong-minded," Garnett says. "When you have other guys who are as strong, obviously you are going to have debates. But I think the young guys can see we can challenge one another without being destructive. "I'm not going to say it was easy, but it was simple. Communicating is the best thing we do. A lot of people talk to hear themselves talk. Here, guys talk with their soul." But coach Doc Rivers needed his trio to listen with the same fervor. His three stars were used to going about things in their own way, with teammates who deferred to them. That was no longer possible, and Rivers knew who would suffer the most. "Earlier in the year, Ray would come to me and say, 'This is the way I used to do it,' " Rivers says. "I'd tell him, 'That's in the past.' Ray is a military guy. It was hard for him. "But I told him if we were going to win this thing, he had to change." When Ray Allen was 8, he had to drop in five lefty layups and five righty layups before he could leave the gym. Sometimes another team needed the floor and he'd run out of time before he could complete his ritual. "I cried," Allen says. "It messed up my day." He did not discuss his compulsion with his teammates, his coaches, his siblings, or even his mother. "I was almost embarrassed by it," Allen says. "It was just always beating inside my brain when I was young and trying to make sense of who I was." They nicknamed him "Hollywood" when he arrived at the University of Connecticut because he was always color-coordinated, always meticulously groomed. He looked like someone important. "I got that from [Michael] Jordan," Allen says. "When I was a kid, every time he did an interview on television, he was wearing a suit. He looked professional. I told myself, 'That's the way to go.' "
Ray roomed with Travis Knight at UConn. Knight was disorganized, messy. Worst of all, he squeezed the toothpaste tube from the middle. "We said they'd never last together," says UConn coach Jim Calhoun, "and they didn't." Ray plotted his workouts as if he were one of the coaches. Calhoun would show the team game film and Allen would ask to see it again, not because he needed to, but because he knew his teammates hadn't paid proper attention. "It's internal," says Calhoun, "but it's there 24 hours a day. Ray does things the right way, and expects others to do them, too. People are sloppy - in their preparation, in the way they present themselves. So Allen harangues Garnett about his sweater-and-tie combos, and the omnipresent Adidas logo on everything he wears. He chastises Eddie House for shooting halfcourt shots at intermission at the opposing team's basket. "Bad luck," Ray says. "Everyone knows that." He talks to Perkins and Glen Davis about their social life. Allen doesn't drink alcohol. He reminds the young big men, "You have all summer to go out. Do it then. Not now. Not with so much at stake." "Ray says he always packs light," Perkins says, "because he leaves his nightclub clothes at home." Allen is certain his philosophy works. When he played in Seattle, a veteran leader among a mass of young, floundering talent, he would complete his pregame pattern, then retreat to the locker room where he'd read, often for more than an hour, before anyone else showed up. Rashard Lewis, a young forward who jumped to the NBA from high school, began quizzing Allen about his routine. Soon he started showing up early, too. Before long, Damien Wilkins, Chris Wilcox, and Luke Ridnour joined them. Ray was the pied piper of preparation. "It got to the point," says former Seattle coach Nate McMillan, "where the first bus was more crowded than the second bus. And that never happens." Allen started a ritual of a halfcourt huddle at the end of games. He didn't just talk to the Sonics about being professional, he showed them how to be professional. "Ray had a really big influence on me," says Lewis, who now plays for the Orlando Magic. "He knew I had the potential to be a great player, but, as he told me, it's the little things that can hold you back. "So much of who I am today is from Ray. He helped me become an All-Star." Not everybody in Seattle bought into Allen's plan. One day, when he arrived at the arena, Allen's regular parking spot was occupied. The owner of the car was Antonio Daniels, who had recently latched on to the early-bird shooting. "I walk in and say, 'Why are you parking in my spot?' " Allen says. "He is acting like he doesn't know what I am talking about. "We are playing the Knicks that night. I think I had about 40 points, but I'm still mad. I'm at the free throw line and Daniels comes up to me and says, 'You need me to take that spot more often.' I hit the free throw, then turn to him and shout, 'You stay out of my spot!' "
McMillan was worried after so many losses that his young players might abandon the Allen plan. But even after a double-digit loss, there was Allen, his head shaved, his shirt tucked in, reading a book, prepared to fight again. "He made my job easy," McMillan says. "No matter what happened the night before, I could always say, 'Ray's here. He's ready. How about you?' "
The Celtics have asked Ray Allen to reinvent himself this season. He plays fewer minutes, takes fewer shots, is no longer the focal point of the offense. "You see him sacrifice," says Perkins, "and you think, 'If he can do it, then I can do it, too.' "
Those changes were palatable for Ray. But he blanched when Rivers changed the team shootaround from the morning of the game to three hours before the game. And when Davis's minutes dwindled, and the coaches asked him to put in workouts before and after games, that cut into Allen's alone time on the floor. "The last time I talked to Ray, he was ticked at Big Baby for not playing better, because he was messing up his pregame," Calhoun says. "I said to Ray, 'You've been in this league 12 years. Don't you have this down by now?' "
Allen is pleased that Rondo has become his pregame partner. He noted that Pierce, who ribs him the most about his eccentricities, has showed up early himself from time to time. In the meantime, Allen has worked to respect KG's ritual from afar. "I've watched Ray," Garnett says. "I've watched Paul, and I've watched Pose [James Posey], and we all have our own way of preparing. All of us are excessive in how we go about it. It makes sense to me. Everybody is a little over the top in what they do, because it means so much." When the Celtics played in Orlando earlier this season, Allen was at the arena at his customary time. He was surprised to see a lone Magic player working down at the other end of the floor - until he realized it was Rashard Lewis. The word in Seattle is that Ridnour, Wilkins, and Wilcox have continued their pregame routine. McMillan, now the coach of the Portland Trail Blazers, reports that he imparted Allen's pregame wisdom to young All-Star Brandon Roy, who is so pleased with the results that he doesn't even wait for the first bus anymore. He goes a half-hour earlier by cab with an assistant coach. The Celtics have benefited most from Allen, who admits he's made more concessions this season than all the others combined. "I'm so happy with Ray," says Rivers. "He hasn't fought it. "Our young guys are lucky to be around him. Too often these kids make it to the NBA and they settle. Ray won't let them." Pierce says he plans to adopt some of Allen's eating habits and offseason workouts. But that's where he draws the line. "If I had to stick to the exact same thing every day, I'd kill myself," Pierce says. "What happens if you go for your pregame meal and there's no more salmon in the freezer? "I love Ray, but I don't get it. I'm not ever going to be at the free throw line saying, 'Damn, I didn't get my parking spot today.' "
The trio of stars has banged into each other throughout the long NBA season. Sometimes, they've even traded elbows. But, when that happens, Ray Allen has learned to retreat to his corner, regroup, and find a way to adapt. The bubble he calls the Boston Celtics can get cluttered. Very cluttered. But, according to Ray's careful calculations, there is still plenty of space inside for a championship trophy.